Nails and More Salon offers your choice of standard acrylic, gel, solar nail sets and fills. We carefully sculpt your nails to a natural finish followed by a polish application with your choice of color. 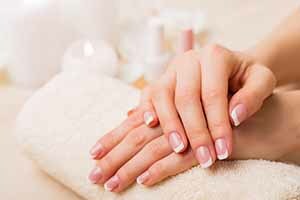 We recommend a fill for your nails every 14 days depending on how fast your nails growth. Natural color acrylic applied over nail tips, or natural nails. Shaping nails to the preferred shape, buff and polished. Shorten, shape and rebalance existing acrylic and apply new acrylic to the re-growth area. Solar Nails Pink acrylic applied over nail tips or natural nails. Shaping nails to the preferred shape, buff and polished. This is great for people with active and affordable lifestyles. A permanent French look created with pink and white/soft white powder. There is no need to wear polish; no drying time and the white won't wear off at the tips! 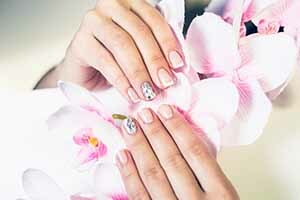 For pink and white nails, a re-fill in needed to rebalance the white when it has grow out. 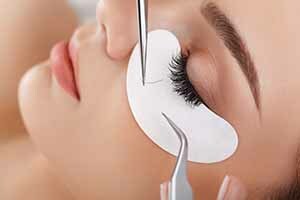 Also includes shortening, reshaping, and filling the re-growth area. 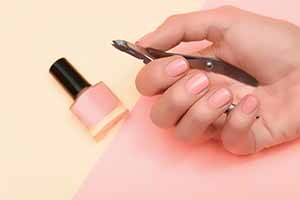 Gel nails are the artificial treatment similar to acrylic in that they extend the length of the nails and make them stronger. 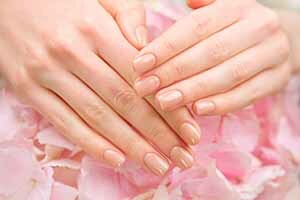 They can be applied over the natural nails or over artificial nail tips. Gel nails are stronger, light and long lasting. Enjoy the definitive for your hand. Treatments includes: cleansing shaping of cuticles, sugar scrub exfoliation to remove dead skin, specialty masque is apply and wrap with hot towel for hydration. This total luxurious come with a massage with rich body moisture cream, Aroma Therapy oils and hot stone leaving you feeling light and refresh. We conclude this luxurious treatment concludes with a paraffin wax for intensive moisturizer. -8 min. Lotion massage and 6 min. hot stone massage. Consist of regular manicure but also with our sugar scrub exfoliation treatment, hydration massage with scented lotion, hot towel and paraffin wax. -8 min. lotion massage. Hand soak, cuticles and nail shaping, light massage with lotion and polish of your choice. Design for Natural Nails, hold their shine and last up 2 to 3 weeks without marring or chipping. They dry within minutes and deliver a natural feeling and extremely thin coat on the nails. SNS is the most natural looking and feeling manicure for your natural nails. No chemical involve in the process of the manicure. No damage to your natural nails with long lasting and glossy finish. Enjoy out ultimate pedicure packages with a hot stone treament to revive your tired feet. Our hot stone pedicure is combined of Super Deluxe Pedicure with a hot stone massage of the feet and legs using Aroma Therapy oils and massaging the stone strategically to relieve soreness and tension leaving you felling completely rejuvenated. -12 min. lotion massage and 8 min. Hot stone massage. Indulge in our traditional spa pedicure also with scented sea salt scrub to remove dead skin then scented sugar scrub for moisturizer to improve your blood circulation. Followed is the scented mask and warp width hot towel to keep your skin hydrated then we massage with scented massge oils and lotion for 15 minute. Has all the goodness of a regular spa pedicure, but also with sea salt scrub to removed dead skin. Followed is the lime sugar scrub to moisturize your skin. Then, we finish the pedicure with scented lotion massge and wrap with hot towel. Rejuvenate your skin by the natural ingredients and enjoy the therapeutic effect which helps to awaken all your senses, alleviate stress, and restore balance. Ingredients include: Dead Sea salt soak that helps clean and hydrate the skin of your feet, and a mixture of sugar, lemongrass and essential oil which works as sugar scrub. Enjoy soaking your feet in the warm water mixed with the Tropical Aromatic foot soak to relieve the skin dryness. The exfoliation process with Pina Colada sugar scrub will remove all dead skin cells from your legs. Last but not least, relax and take a sip on a virgin Pina Colada mixed by us while getting your feet pampered. Indulge in a roller massage chair system while soaking your feet in a whirlpool spa. This pedicure include: toe nails cut and shaped, cuticles trimmed, callus skin removed, sea salt scrub to remove dead skin, lotion massge and hot towel wrap. Include Me! Bath's Strawberry Kiwi bath ice cream, sugar scrub, massage lotion and more. Signature Herbal Spa rich in natural ingredients including: green tea, exfoliating gel, soothing foot mask, and hydrating lotion. This Jelly SPA Pedicure Bath Set provides the ultimate SPA pedicure experience for relaxation using heat therapy and aroma therapy, which soothes aching joints and muscles. Jelly Bath is FREE of harmful chemicals or preservatives and is fully bio-degradable. 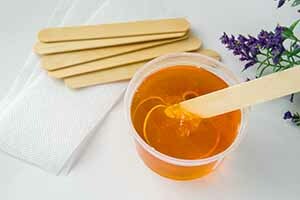 The Jell-ous Feet Treat’s key extracts include Rose, Green Tea, and Lavender. 8) safer skincare with powerful result. Deep penetrating moisture treatment for hands and feet, great for dry rough skin or arthritis suffers, have a paraffin treatment in addition to your manicure or pedicure to enhance results or 'ala carte'.